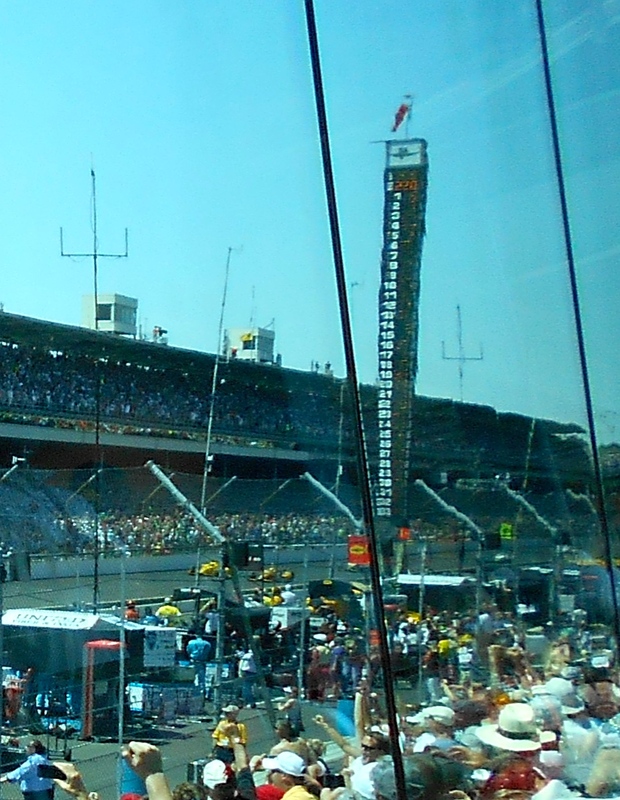 Ryan Hunter-Reay held off Helio Castroneves on the final lap to win the 2014 Indianapolis 500 by 0.0600 of a second. It was the second-closest finish in 98 runnings of the 500. So how did Hunter-Reay, who had never won Indy, manage to hold off Castroneves, who had already won it three times? That’s a subject that will probably be debated indefinitely. The lead changed hands between those two drivers five times in the race’s final six laps. On a restart after a red-flag race stoppage, Hunter-Reay had the lead, with 19 other drivers who were still on the lead lap, right on his tailpipe. Closest to him were Castroneves and Marco Andretti (who lost to Sam Hornish in 2006 by 0.0635 of a second – the previous second-closest finish). When the drivers were waiting out the red flag, to be able to return to racing, Hunter-Reay’s car owner, Michael Andretti, said, “Go win it. You’re the best driver out there, go win it.” Hunter-Reay appreciated the vote of confidence in his driving ability; but he also believed he had the best car. It was difficult for Michael Andretti to say that, given that his son was also right in the middle of it. But Michael had seen a couple of instances earlier in the race where Marco’s car came up short trying to pass Hunter-Reay’s. “I think he was running too much downforce,” Michael said. When the green flag flew, Hunter-Reay had the lead. But Castroneves quickly passed him on the inside going into turn one. It was a textbook slip-streaming move that is almost impossible to defend against with today’s IndyCar aerodynamic package. The lead car punches a big hole in the air; the trailing car gets essentially a free ride. The challenger can build up momentum in diverted air behind the leader, then swing out to the side, and his momentum will carry him past. Castroneves almost carried Andretti right behind him too, which would have probably spelled the end of Hunter-Reay’s chances. But Hunter-Reay was able to defend his position. Andretti had to back out of the throttle, although by the time the lead trio got to turn three, Andretti was threatening once again to pass Hunter-Reay. Castroneves benefited a little from the duel between the Andretti teammates, and managed to hold the lead past the start-finish line completing lap 196 and beginning lap 197. Castroneves was still in front, as he towed the field down the backstretch behind him. He blocked the low line on the track, seemingly daring anyone who wanted to pass him to have to go the “long way around” on the outside of his car. That’s when Hunter-Reay made the move of the race. Instead of going outside, or backing off (the most prudent choice), he darted onto the track’s inside apron – off the racing surface – and nearly into the infield grass. The move so faked out the ABC cameras covering the race, Hunter-Reay darted out of the shot. No one seemed to get a decent picture of it. Had he gotten his wheels into the slippery grass at better than 220 m.p.h., it likely would have been over for him, Castroneves, Andretti and any number of other close pursuers who would have had little time to avoid a chain reaction crash among the frontrunners. What Hunter-Reay did, by the laws of physics, shouldn’t have worked. Normally a turn like No. 3 at Indy is taken with the widest possible entry, near the outside wall, with a cut to the inside apex, before letting the car drift back out to the outside wall at the end of the corner (entering the “short chute” straightaway). This is carrying the maximum arc through the corner, so the maximum speed can be maintained. Hunter-Reay went into the corner on the inside, and had to make a much sharper turn, hit that apex, while still carrying carry his speed over 220 m.p.h., to the end of the turn. This was an un-tried line, and from a physics standpoint, nearly impossible. “We had never run that line before,” he said. “Not all month, in practice, or anything.” Nor had anyone else in Indy history! He didn’t know if he could go into that corner at that sharp of an angle and still carry his speed, keep traction to his tires, and keep from sliding out to the short chute’s outside wall, upon his exit from the corner (Gordon Smiley was killed here, trying to carry to much speed into the short chute, in 1982). “Maybe I was going to get pushed off in three and go into the wall,” Hunter-Reay said. “I was going to be ‘in the gray'” or “marbles”, as the diabolical debris outside the racing line is called. Ironically, it was Hunter-Reay who had sized up his competition for this final few laps and decided, “I was racing Helio and Marco, so I knew there was going to be no funny business. We were going to race each other hard, take our line and stick to it. There wasn’t going to be an unexpected move at the wrong time or something sketchy.” So the wild card ended up once being again Hunter-Reay himself, who had been roundly criticized at the Long Beach race earlier in the season for a “sketchy” move that caused a chain-reaction crash that took out most of the race leaders. 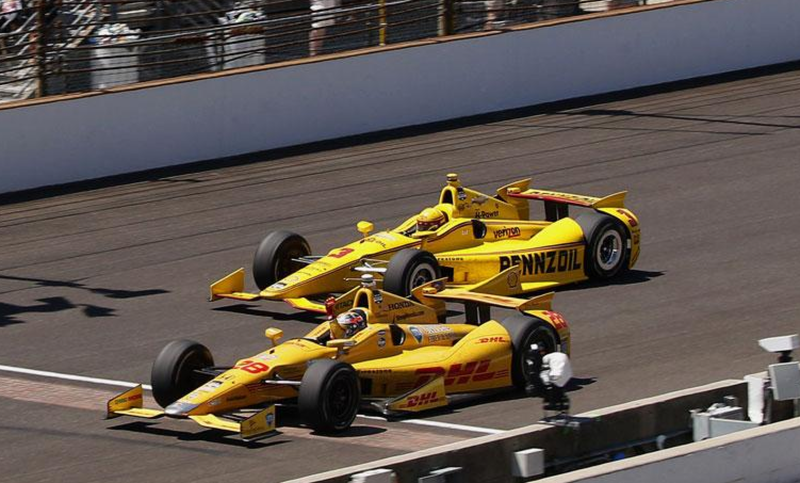 Michael Andretti said this time Hunter-Reay’s boldness paid off – for him, at least. Indeed, Castroneves seemed to be improvising strategy the rest of the way. It took Castroneves more than a lap to get back into a position to catch Hunter-Reay and re-take the lead. At the end of lap 198, as the two leaders passed the start-finish line again, Castroneves made another standard slipstream pass on the inside. It was fairly easy and predictable that Hunter-Reay would return the favor a lap later, and pass Castroneves at the start finish line as lap 199 ended and the white flag waved for the final lap. Castroneves sized up the competition. He and Marco were running essentially the same line. Hunter-Reay was able to get away with running a different line – particularly dangerously low lines in and out of corners. “That’s why we were able to go back and forth, back and forth,” he said. Castroneves thought he might just have a surprise of his own for Hunter-Reay coming out of the last turn, heading for the checkered flag. He figured Hunter-Reay would defend his position on the track’s low line coming out of the corner, and Castroneves would try to draft past him – on the outside. Hunter-Reay said he believed his car was better coming off of turns two and four at that point. Hunter-Reay was worried that staying high would open the door to Castroneves to dart inside of him – just like Castroneves had done to him on the previous laps – and like Hornish had done to Marco Andretti in 2006. “I knew I had to be aggressive,” said Hunter-Reay; he decided to pinch his car as low to the inside line as he could through turn four. He did indeed defend the low line against Castroneves – so low he was nearly in the grass again (ABC missed it again, pre-occupied with reaction shots from Hunter-Reay’s wife Becca and Castroneves’ girlfriend Adriana in the pits). Castroneves was just catching Hunter-Reay’s right rear wheel as they crossed the one yard stripe of bricks at the finish line. By the time both cars had completely crossed it, Castroneves nosed ahead. But the race was over. Hunter-Reay had taken the checkered flag first. Andretti three-tenths of a second back in third, was now Indy’s all-time hard-luck loser: two Indy 500s lost by a total of .38 of one second. While Hunter-Reay was jubilantly celebrating, Castroneves remained in his car for many minutes, trying to gather his composure. Hunter-Reay’s victory won him almost $2.5 million. The Indy 500 still rocks ! One more time one of the 3 most famous races in the world has delivered a solid entertaining, too sad watching empty spaces on the enourmous grandstands and the grand names bypass the important appointment with the glory: hat off to the winner and to Juan Pablo Montoya, Jaques Villeneuve and all other 30 racers. I’m confident the golden era of the 60s, 70s and 80s will be back. If the Golden Era will be return, maybe people will look back at 2014 and say “that is where it started!” Thank you for writing.